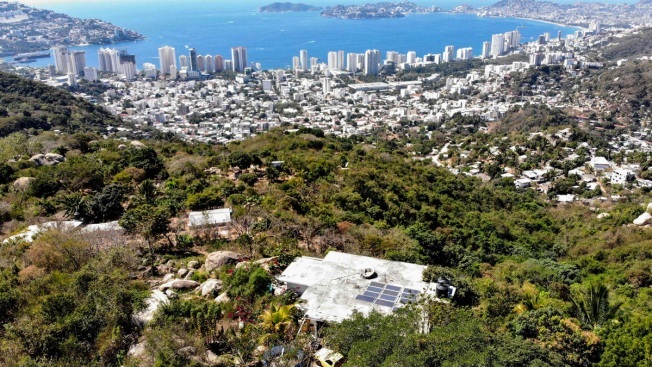 Aerial view of the house (bottom) where a US citizen who allegedly was an activist in favor of the legalization of marijuana, was shot dead the day before by armed suspects in Vista Hermosa neighborhood in Acapulco, Guerrero state, Mexico on February 2, 2019. - Prosecutor's office informed it is investigating the attack at the victim's home, where it was also found "a drug processing laboratory with several plants, apparently of marijuana." Associated Press writer Jose Antonio Rivera contributed to this story.